This entry was posted on November 17, 2014 by PLADInc. 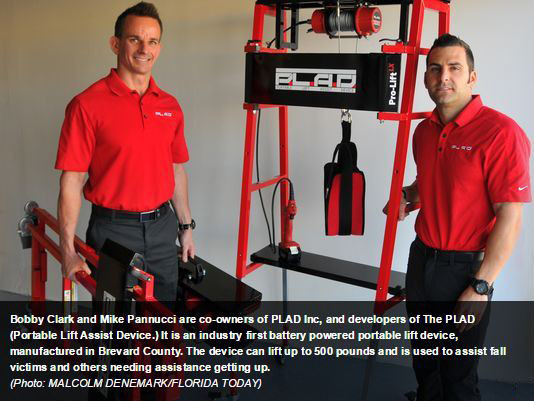 Indialantic, FL -- PLAD, INC. recently showcased its revolutionary Portable Lift Assist Device at this year’s EMS World Expo in Nashville, TN. 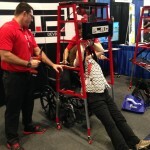 “We recently launched our new Portable Lift Assist Device at EMLRC's ClinCon 2014 with overwhelming support and positive feedback,” stated Bobby Clark, Chief Executive Officer of PLAD, Inc. “We were excited to demonstrate the PLAD again at the EMS World Expo to key decision makers in our industry." “The product speaks for itself and will be showcased at an amazing event," stated Matthew Nicoletti, Managing Partner of PLAD, Inc. The National Institute of Standards and Technology (NIST) reported that approximately 81,000 firefighters in the United States were injured during 2002 at a cost of $3–8 billion. Most injuries to firefighters occur on the fireground, and many of these injuries are musculoskeletal-related. The musculoskeletal system’s primary functions include supporting the body, allowing motion and protecting vital organs. Sprains and strains, including those of the low back and abdominal regions, account for most of the musculoskeletal injuries in firefighters. And back injuries represent the vast majority of these injuries. Further, low back injury is the most common injury related to early retirement from the fire service. The high rate of low back injuries can be attributed to the high-risk activities that firefighters are expected to perform, such lift assists. These tasks are often accomplished while the body’s posture is ergonomically unsound or on unstable ground. 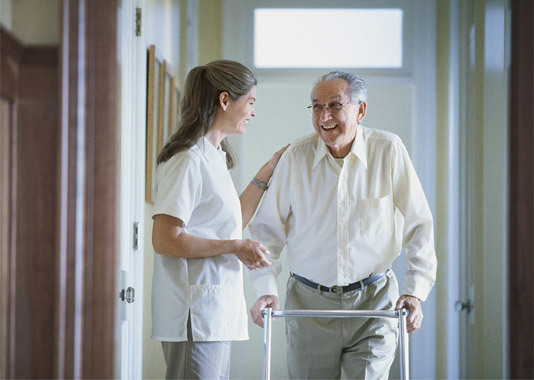 To purchase a Portable Lift Assist Device (P.L.A.D), please visit: www.pladinc.com. To view the P.L.A.D. in action, visit http://youtu.be/QxrqmwW_Vzs and http://youtu.be/AHX3sXqtGrA. In professions such as firefighting, nursing, and first responders back injuries are a common problem when performing lift assists on individuals while on the job. Statistics show that in these professions, especially within the field of Emergency Medical Services, the rate of back injuries is very high with an increasing percentage of those back injuries being career ending. These back injures not only impact these individuals’ lives, but there is a large resource and monetary impact from Workman’s compensation claims that can cripple municipalities. Prior to the PLAD, there has not been a solution to lift assists that takes the possibility of back injuries out of the equation. Firefighter Mike Pannucci was finishing up medic school when he was tasked with a final project that required him to provide a solution to a current problem the industry faces and present that solution to the class. From his experience as a firefighter, he knew exactly what he wanted to base his project around and that would be the growing number of back injuries associated with lift assists. From this class, this assignment, the PLAD was conceived. Looking for assistance to help design and fabricate a device that could safely lift an individual, Mike turned to longtime friend and designer, Bobby Clark. Together, the two worked successfully on finding the right balance between a device that was extremely portable and could easily be deployed to safely and comfortably lift a person to a seated position. They went through several iterations of the PLAD until the final product that is available today got their final stamp of approval. PLAD's main mission is to eliminate the possibility of back injuries from performing lift assists. By creating a lifting device that is light weight and extremely portable, countless other benefits were also created in the process. In the case of firefighters, multiple teams of two no longer are required to assist in a lift where the individual weights over a certain amount. A team of two can easily deploy the PLAD and safely lift an extremely heavy individual without compromising themselves thus freeing up additional resources, which otherwise would be needed for a team lift. Commonly, when performing lift assists, it can be time consuming just trying to figure out the approach to lift the individual. With the PLAD, that guess work is a non-factor because the PLAD can be deployed within a couple of minutes, which greatly shortens the time the fallen individual is in a compromising position. Now that you are aware of the PLAD, the most portable lift assist device available, can you afford to send your team out in the field to perform a lift assist with the possibility of one of them injuring their backs? Would you perform that lift assist yourself?